Globalisation and the rapid increase in world trade in the past decade have contributed to greater demand for international transport and logistics and, consequently, the expansion of the maritime industry. The dramatic changes in the mode of world trade and cargo transportation make it more important than ever to have a clear understanding of the way in which freight is transported by sea and the role of ports in this exchange. At the cutting edge in its assessment of the industry, Maritime Logistics covers the whole scope of maritime logistics and examines latest logistical developments within the port and shipping industry. With a range of new international contributors, this new edition has been thoroughly revised and updated. There are new chapters on port centric logistics, hinterland logistics and global supply chains, maritime transport and logistics as a trade facilitator, and future trends and developments. Written by a team of international experts with over fifty years' experience in the field, Maritime Logistics provides a truly global perspective. 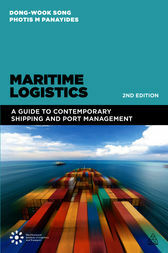 The book covers everything that students of logistics, as well as those working within the industry, need to know about maritime logistics, including shipping lines, containers, tankers, dry bulk, port-centric logistics, and much more. Dong-Wook Song is Professor of Transport and Logistics at the Transport Research Institute, Edinburgh Napier University. His work is well-recognised in the field and he has received a number of The Best Paper Awards from academic associations and communities. He sits on the editorial board of established journals in transport and logistics. Dong has worked as a consultant for a number of private and public organisations including the UN, OECD, ADB and World Bank. He has served as an elected council member at IAME since 2012. Photis M Panayides is Professor in Shipping Economics, Department of Commerce, Finance and Shipping at Cyprus University of Technology. He reviews for several major journals in the field and has pioneered the development of academic and professional programmes in shipping and logistics. He sits on the editorial board of established journals in the field.